"THE FEAST OF THE LORD IS GOING ON!" 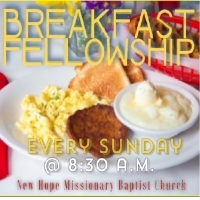 Join us for breakfast shortly after our 7AM service we'd love to have you! Come to the service to feed your soul then come to breakfast to feed your body! Stay for Sunday School and enlighten your mind!